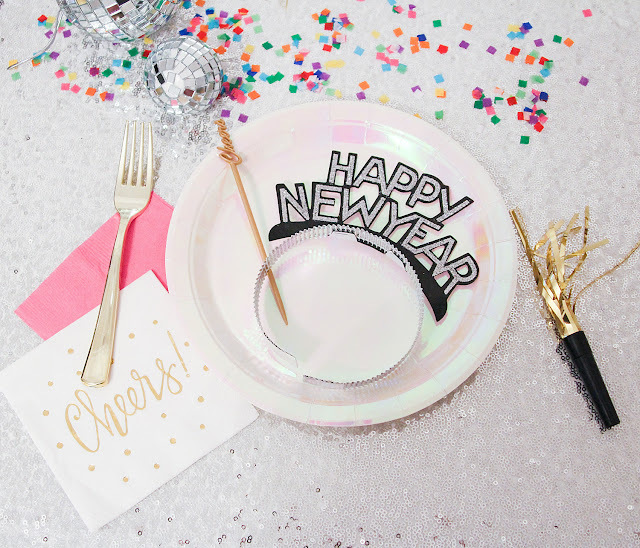 When you think of New Years you might think of black, gold, and silver but you can have a colorful New Year’s Party too. Your guests will love the unexpected splash of color to liven things up. Of course you can still mix in metallics too which really do scream New Years Eve. Since New Years parties are often late, I created this to be a desserts and drinks party. Which is perfect for after dinner soirées. Here’s what you need to pull off this colorful New Years Party look. Invitations are a great place to find inspiration for your party theme. 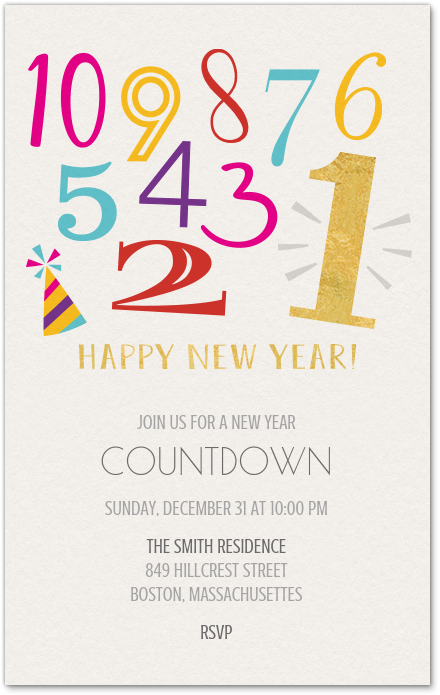 I picked this one from Evite.com, and the design is what sparked the inspiration for my colorful New Years Party. You already know I’m a big fan of Evite and the convenience it offers. Evite Premium Invitations are Evite's newest ad-free, fully customizable invitations with customizable digital envelopes and stamps. They look as upscale as printed invitations but at a lower price. Plus it comes with all the perks free Evite invitations like RSVP tracking and free reminders. You can even create the invitation from your phone and invite guests via text. There are so many options and all of them are designed to make your life easier so it's a party must-have, in my book. Right now, Evite is running a holiday promo! Purchase any Premium Invitation by Jan. 2 and get your holiday cards for FREE. For New Years parties I love to throw in sequins and shine every chance I get. This sequin tablecloth is perfect for the occasion and contrasts nicely with the gold cutlery and cake topper. 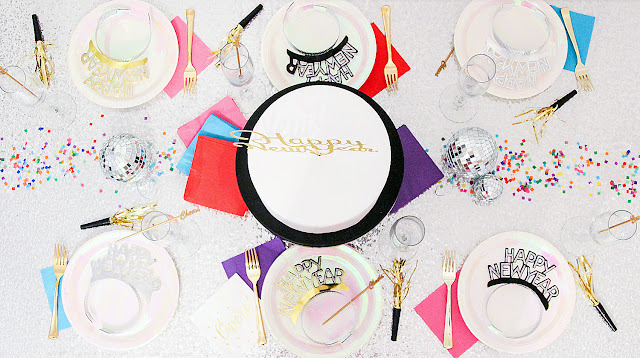 Use napkins and confetti to bring in inexpensive pops of color without overwhelming your look. Disco balls are also a great prop for this theme. I don't usually have favors for adult parties but New Years is definitely the exception. Your guests will love to wear Happy New Year headbands and hats while blowing gold party blowers at midnight. They double as decorations too. You can find these in large packs from most big box stores or online. Champagne is a must have for any New Years Party. Serving it in glass champagne flutes will really elevate the look of your party. Bonus points if you throw in a "cheers" drink stirrer. 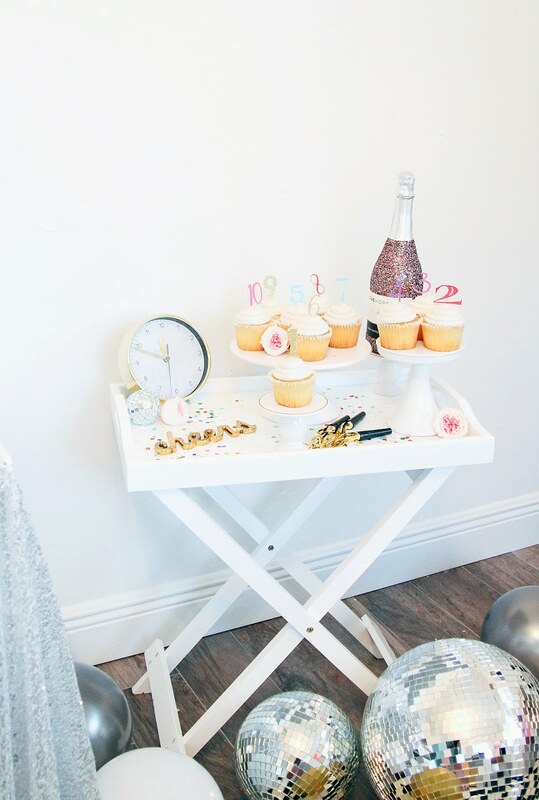 Try offering 3-4 different champagne options and creating a "champagne bar" for your guests. Of course you need a cake for your party. 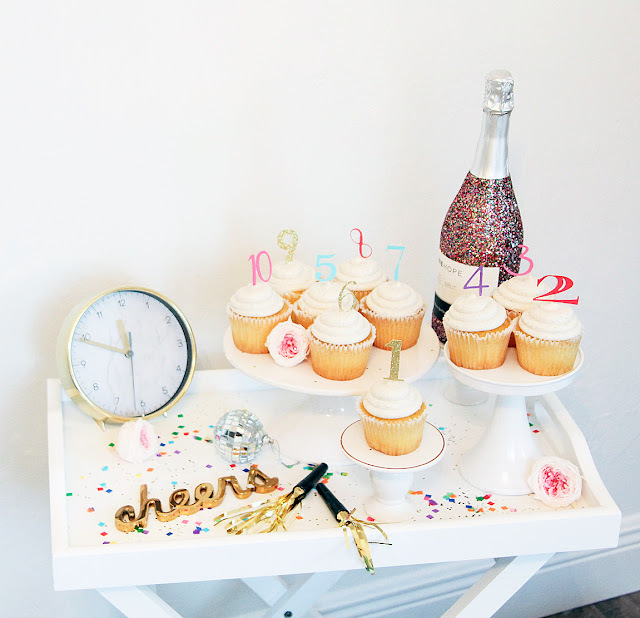 My favorite money saving party tip is to get a simple cake with a pretty cake topper. You also don’t need your cake to be large enough to feed all of your guests. 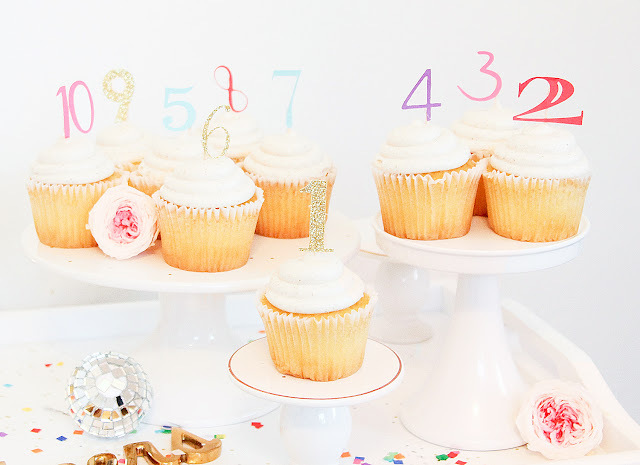 You can get a cake in whatever size you want and then make sure you have enough cupcakes for everyone, which is a huge money saver. We added number cupcake toppers to make these countdown cupcakes match the Evite invitation. 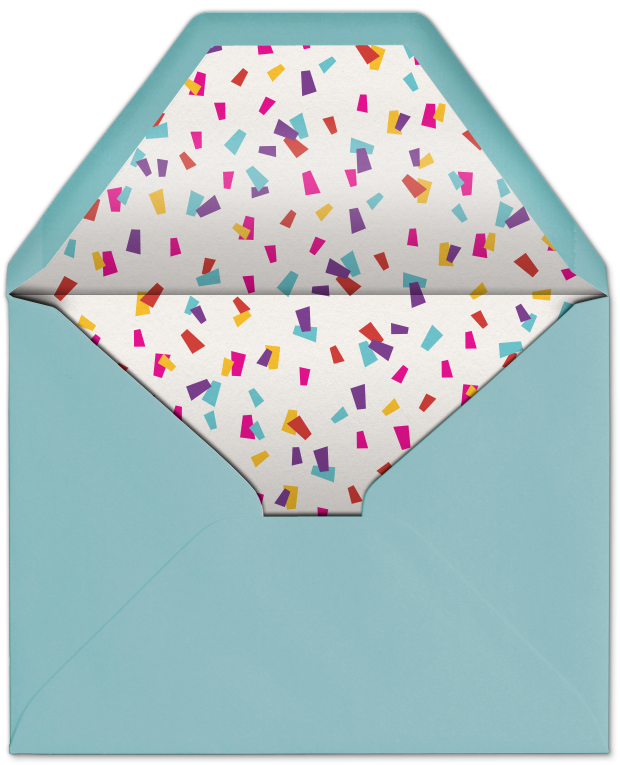 Don't forget- for the holidays, Evite is having a great promotion where you can Send any Evite Premium Invitation and get your Premium Holiday Cards for FREE. Discover Evite Premium this Holiday season!